When it comes to leather car interior care information, there are plenty of myths and very few solid facts. I hope to clear up some of those myths, so you can give your car’s leather interior the care it needs to look great for many years to come. Waxit.com.au offers a full line of professional grade leather conditioner and leather protector products for all types of leather: aniline, pigmented/topcoat, nubuck/suede and specialty leathers. Not only is this not true, but the myth is costing new car owners a lot of money! This is a serious misconception many people have, including car sales professionals. Modern car leather upholstery has a super thin vinyl coating for protection. This does not negate the need for regular care. It’s true that modern leather interiors are more durable than leather finishes prior to 1990. This is due to new technology in leather upholstery manufacturing. That said, automotive leather upholstery still needs regular cleaning and treatment. The fresh scent of fine leather is very alluring. It does not have to go away. If you properly maintain your car’s leather interior, the scent will remain naturally for many years. If your car looses the leather scent, you can partially restore it by hydrating the leather. There are also leather scent car fresheners for this purpose. If your car was produced before 1990, this may be true. However, if the car’s leather has a vinyl coating (95% of all cars manufactured after 1997 do), a cream-based conditioner can’t get through the micro perforations in the vinyl coating to treat the leather. In other words, all the cream treats is the vinyl coating. What’s needed is a good liquid leather conditioner that can reach the leather to hydrate and condition. Plain water will not hurt leather. In fact, leather is tanned and cured using water. What’s damaging to leather (stain wise) is stuff in water. 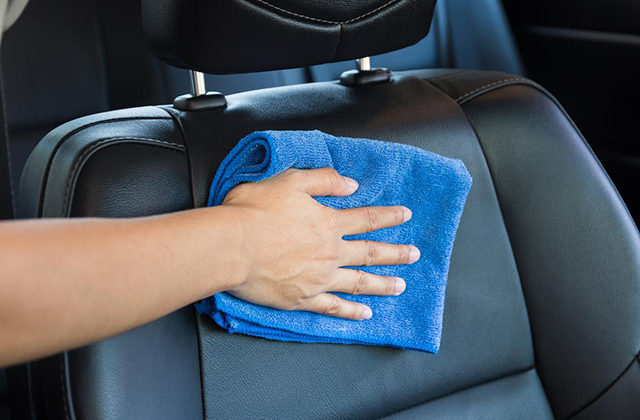 You can wipe your leather upholstery with a damp cloth with no problems. You can even scrub your leather with a bucket of soapy water. Just be sure to fully dry your leather after it gets wet to avoid any chance of discoloration. Give your car’s interior regular care. That means regular cleaning and regular conditioning. If you carry out these tasks, it will never require heavy cleaning and conditioning. You’ll save time and money. There are many good leather cleaning and conditioning products. The oldest and most respected name in leather care is Lexol. It’s best to clean and condition your vehicle at least four times each year. Actually, monthly is more ideal. To make the task as easy as possible, try a combination of the wipes and sprays. Use the wipes when time is of the essence. Use the sprays for deeper cleaning and conditioning. Be sure to check out How to Clean a Car Interior the right way!